A special aspect of this particular Weekend was the diversity of the sites explored. These included the series of prominent public spaces first laid out in Alexander Ralston’s Mile Square Plan for the city – the Indiana War Memorials Historic District – as well as less well-trodden landscapes, such as Marian University’s EcoLab, a Jens Jensen-designed landscape that is publicly accessible but not widely known among locals. 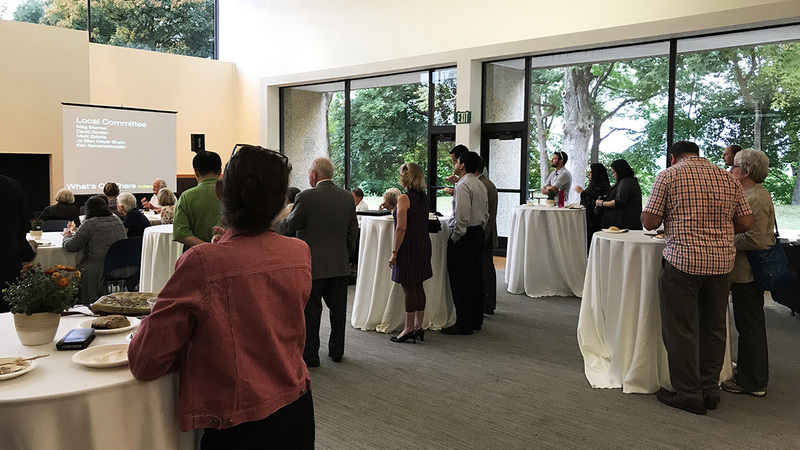 The Weekend opened with an evening reception at the Christian Theological Seminary, with hors d'oeuvres generously sponsored by Bartlett Tree Experts. A full-to-capacity tour of the Dan Kiley-designed landscape preceded the reception – it was so popular that expert guides Steve Mannheimer and David Gorden offered a reprise at the conclusion of the evening to those who had missed the first tour. On a sunny Saturday, an eager group of locals and visitors participated in an early morning tour of Indy’s downtown cultural landscapes, led by urban designer Tom Gallagher – the central War Memorial Historic District, and more contemporary designs, including Georgia Street, the Cummins Distribution Headquarters, and the Julia M. Carson Transit Center. David Rubin, of Land Collective, shared insights about his own designs at The Commonground at Eskenazi Health and the Cummins Distribution Headquarters grounds (Rubin traveled from Philadelphia just for the day!). Other Saturday morning tour highlights included the Ball Nurses’ Sunken Garden, led by Kevin Osburn; Holliday Park and The Ruins, led by Adam Barnes; and Garfield Park Conservatory, led by ­­­­­­­­­Elizabeth Schleicher. A golf cart tour – a first for a What’s Out There Weekend – was a fun and unique way to experience the Brendonwood Common Historic District, with commentary by Sally Rowland and Cathy Allen, longtime residents of and experts on the neighborhood. That afternoon, the sun shone brightly as Jonathan Wright, Chad Franer, and Chandler Bryant led tours of the various cultural landscapes of the Indianapolis Museum of Art: the Oldfields and Westerley estates and Virginia B. Fairbanks Art and Nature Park: 100 Acres at Newfields. The gardens were in a transitional state (with the summer season coming to a close, and preparations for the holiday season well under way), an excellent opportunity to learn about the thousands of bulbs to be planted for spring by myriad volunteers in the coming weeks. Meanwhile, other attendees gained exclusive access to the private Leppard Estate, with insight from Barth Hendrickson, one of its landscape architects. The George Kessler-designed Riverside Park and the neighboring Riverside Drive Historic District, whose advocates recently put forth a bid for a National Register Nomination, were the subjects of an extremely insightful walking tour by Phyllis Hackett and Mark Dollase. Tours of Tarkington Park, by Jenny Burroughs of the Parks Department, and Woodruff Place Historic District, by neighborhood leaders Will Pritchard and Tom Abeel, rounded out the afternoon. This full day concluded with a reception at Crown Hill Cemetery, with refreshments generously provided by the Crown Hill Cemetery & Heritage Foundation. Though initially advertised as a self-guided tour, a special presentation on the cemetery’s history by its president, Keith Norwalk, and a tour of its grounds were welcome surprises. The reception drew more than 100 guests, many of whom had been part of tours earlier in the day. Sunday’s tours continued to illuminate the varied cultural landscapes of the city, and day two did not disappoint. In the morning, the Massachusetts Avenue Commercial District tour, led by Meg Storrow, was a riveting encounter of an area undergoing tremendous growth as a cultural destination. Kevin Osburn led a bicycle tour – always a What’s Out There Weekend favorite – of the Indianapolis Cultural Trail, a recent addition to the city that weaves many of its urban landscapes together through an eight-mile network. Mark Zelonis brought visitors on a splendid trip to the Sloan Residence, another Jensen landscape. Doug Day’s Fall Creek Greenway tour highlighted the historic bridges, contemporary public art, and abandoned industrial infrastructure along the Greenway trail. A tour of White River State Park, although cut slightly short by rain, gave important insights into this waterfront revitalization project that has enlivened the area. The Weekend concluded with a presentation by Meg Storrow on the historic Indianapolis Park and Boulevard System, with closing remarks by Linda Broadfoot, Indianapolis Director of Parks and Recreation. Thanks are owed to many for the wonderful success of the Weekend. In particular, none of this could have been possible without the leadership of the Indianapolis Cultural Landscapes Committee, headed by Meg Storrow, chair, and David Gorden, co-chair, with Mark Zelonis and Jo Ellen Myers Sharp. Thanks also to the exceptional expert tour guides and volunteers, and to our phenomenal local and national sponsors: the Lilly Endowment, Wilhelm Construction, the Efroymson Family Fund, Indiana Landmarks, Mark M. Hoelman, Inc., Bartlett Tree Experts, the Indiana Chapter of the ASLA, the IMA Horticultural Society, Victor Stanley, and the National Endowment for the Arts. Please visit the comprehensive and richly illustrated online guide, What’s Out There Indianapolis, to learn more about the cultural landscapes featured during the Weekend, and many other landscapes throughout this Midwestern metropolis.